It’s an incredible concept that, until now, has been shrouded in some mystery. BMW Group Design head Adrian Van Hooydonk unlocks some of that mystery by explaining the concept, the drivetrain and the three directions in the video above. Below we also have a full gallery of new images and another more brief (i.e. readable) press release. 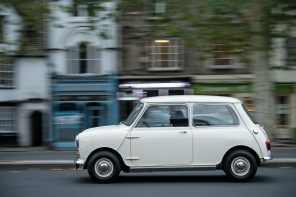 Official Release: Iconic British brand MINI unveils its exciting MINI Scooter E Concept today in London. This new design study represents the MINI design teamâ€™s unparalleled expertise in recognising the challenges for mobility in major urban areas, and meeting these challenges with the development of stylish, innovative and sustainable future-focused vehicle concepts. The MINI Scooter E Concept comes almost ten years to the day since the new MINI was first shown at the Paris Motor Show. Agyness Deyn, model and icon of British fashion and design culture is in the Capital to help debut the MINI Scooter E Concept. She will celebrate the global premiere at a private London location this evening featuring an exclusive DJ set by electropop artist, Little Boots. Three MINI Scooter E Concepts. The new scooter design concept is based on current production vehicles but pushes the creative boundaries. Just as the compact design of the classic MINI, born out of the 1950s oil crisis, symbolised a new reality for modern city driving, the MINI Scooter E Concept is designed for the changing landscape in environmental and urban road traffic conditions, to offer a stylish and emission-free alternative for urban mobility. 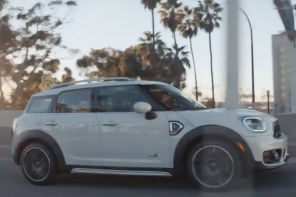 Set to appeal to a young, ecologically-conscious driver, the MINI Scooter E Concept offers a completely new perspective on the distinctive MINI driving experience while being immediately recognisable as a MINI. Unmistakably MINI: an authentic reinterpretation of unique details in three design versions. Distinctive features include the circular central instrument cluster, the iconic speedometer, the visually prominent indicator lamps in the style of the classic Mini and the chrome trims on the bodywork. In addition the colours and materials all serve as identifiers, making the MINI Scooter E Concept recognisably a MINI at first sight. The design concepts differ in the number of passengers they carry. The first MINI Scooter E Concept is a two-seater variant developed for â€˜the fun of driving for twoâ€™. It mirrors the colour scheme of the current MINI E hatch prototype, 40 of which are currently on trial on UK roads – with body paintwork in matt charcoal, a yellow seat and yellow-painted mirror caps – and emphasizes the particularly intense aspect of zero-emission driving. The second concept is a single-seater and the sportiest of the new concepts. Almost purist in design, this model nods to the British heritage of the brand. Features include a classic combination of an upholstered seat in dark brown leather, paintwork in British Racing Green and silver mirror caps reminiscent of iconic racing cars. The third and more design-progressive model â€“ being shown exclusively in London â€“ takes inspiration from the popular culture of the 1960s, a decade synonymous with the classic Mini, drawing on the distinctive graphics of the Mod era in particular. The white body colour on this two-seater variant is decorated with numerous applications and stickers, with the left hand mirror cap featuring a MINI logo and the right hand one featuring the red, white and blue cockade of the Royal Air Force. The piece de resistance is a perforated leather seat through which the Union Jack shines. Smartphone as key, display and central control element. A snap-in adaptor for a Smartphone allows the driver to use their mobile device as a route finder, music player or as a phone via a wireless Bluetooth interface from the MINI â€˜cockpitâ€™. As soon as the rider docks his mobile phone and switches it on, the vehicle is ready to go. A navigation app enables drivers to know where other MINI Scooter E Concept drivers are on the map, similar to social networking systems, to encourage interaction between the MINI Scooter E community. Technology currently in development will mean headlights on the scooters automatically open when they meet on the road. All you need is a power socket. The MINI Scooter E Concept is driven by a built-in rear wheel electric motor which is powered by a compact lithium-ion battery. The battery can be plugged into any standard AC power outlet. A display screen clearly indicates to the driver the amount of battery life available: the MINI Scooter E Concept can be charged via a retractable lead in the rear of the Scooter. MINI Centre Rail â€“ the unique solution with specific accessories. The study also incorporates an innovative version of the MINI Centre Rail first presented earlier this year in the new MINI Countryman. The unique clip-on mechanism offers a range of options for transporting items that may required before, during or after the journey, for example a helmet, umbrellas, sunglasses and thermos flasks. With all the fun, sporty design principles and agile handling typical of MINI, the MINI Scooter E Concept is easy to operate and perfect for the challenging traffic conditions of the city. 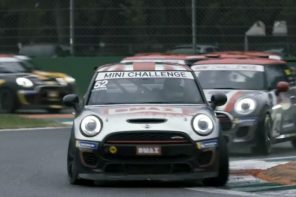 It is a sustainable and fun way to enjoy the MINI driving experience and epitomises urban mobility at its best. Next articleMINI Scooter E. The Big Question: Why?